Ten-year-old Bermuda golfer Oliver Betschart recently returned from competing in Florida, where he took part in the North Florida PGA Junior Golf Tournament at the TPC Tampa Bay Golf Club and the Drive Chip and Putt Sub Regional Qualifier at the World Golf Village Slammer & Squire Golf Club in St. Augustine. On August 16 and 17, he competed at the North Florida PGA Junior Golf Tournament at the TPC Tampa Bay Golf Club in Lutz, Florida; after the first day, he was in fifth place before finishing in fourth on the second and final round. 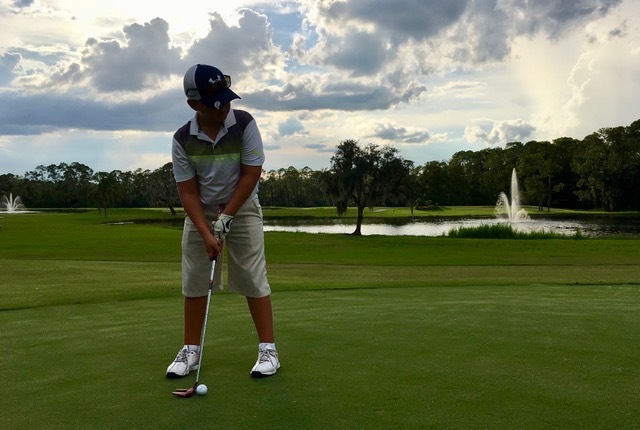 On August 25, Oliver was invited to compete in the second round of the Drive Chip and Putt Sub Regional Qualifier, which took place at the World Golf Village Slammer & Squire Golf Club in St. Augustine, Florida. “After having good results in the driving and putting, his chipping was not quite good enough and left him with a 10th place finish, with only the top two competitors moving on to the Regional Qualifiers,” a spokesperson said. “Both events were great experiences and gave Oliver a chance to compete against his peers overseas. During his stay he was also able to play on some amazing PGA and Senior PGA courses such as King & Bear, St. Augustine [the only course ever co-designed by Jack Nicholas and Arnold Palmer], Slammer & Squire, St. Augustine [designed by Sam Snead and Gene Sarazan], and The Walt Disney Magnolia Palm Golf Course in Orlando. However the main thing that stuck in his mind was the fact that the water and sand traps were not the only hazards that you had to watch out for, but also the alligators and snakes.